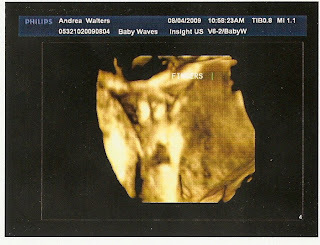 The House of Walters: Baby Waves Take 2! On our first visit to Baby Waves (which is a 3D/4D ultrasound), we couldn't get a good look at Mattie Kays face....so they invited us to come back and try again for free. Free? Sure! Why not? So this morning we had our second appointment. Let me just say that Mattie is very stubborn and refused to turn over. She stayed in her one position and wasn't budging! She was laying on her belly with her face smooshed into the placenta....no face photos today either. But we were okay with that! I think that the technician was more upset than we were. I am only going to post two photos from today since I posted several from the last trip. 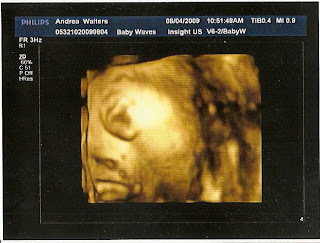 The first one is of her precious little hand and the second photos is the side of her face (she is looking to the right) and you get a good shot of her ear and her chubby cheek. She measured in at 3 pounds (90th percentile) and she has hair! Yay!!! So, her beautiful face will remain a mystery for now but we were just pleased to see her doing well!